Compassion Fatigue 101 Webinar is specifically designed to support people who work or volunteer with animals. A Facebook friend of mine shared with me a link this week that I though was genius! I just had to find out more and share with my friends in the animal rescue community. Jessica Dolce is a Certified Humane Education Specialist via the Humane Society of the United States. She says her goal is to help "people feel less isolated, more empowered, and better supported in their role as caregivers to people, pets, and our planet." 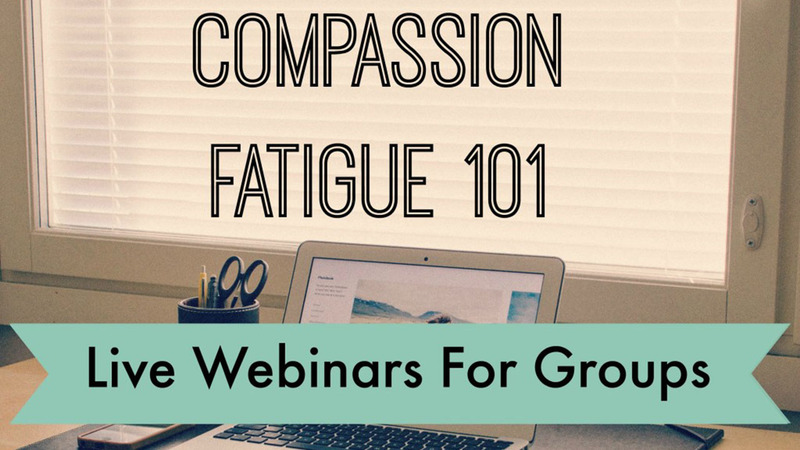 Her Compassion Fatigue 101 Webinar is specifically designed to support people who work or volunteer with animals. She has a great deal for groups. You pay one price for the group, but you are allowed multiple log-ins and participants. I love her message to caregivers, especially those who work with animals: "I believe we can do good things in the world and take care of ourselves too. Here's the deal: self-care is not optional. In order to do our very best work, we must invest in our own well-being. Taking care of ourselves is the foundation of doing sustainable, effective, and ethical work." If anyone takes part in her webinars, please share your experience. I would love to know if you thought this kind of class was helpful.